I hope you enjoyed the beautiful January weather because it is almost over. Incidentally, I had to travel to south Florida last week to help my parents with a move. It was warmer in Reno than Naples, Fl. Go figure. It won't be this week. This past week a 15 year old rider died at Mt. Rose. A very tragic event. Totally avoidable. Unfortunately, the rider made a critical mistake. From what I have heard, the rider and a friend thought conditions were too icy and decided to walk down the hill. That was a fatal mistake. In addition, the victim removed his helmet. This will be a quick update. First of all, this blog is dedicated to storms that affect the Tahoe area. I have not taken a vacation, winter has taken a vacation. If you are not hearing from me, assume that the weather will be dry. Since early October, this is the longest dry span that we have seen. If you want to know your local weather, watch the local news, they are good at telling you what it was like earlier in the day. Of course you could also just look out the window and see for yourself. As the January thaw continues, the valley golf courses are now all open. Even Arrow Creek is at least partially open. Our mild weather will continue until at least the middle of next week. There is some conflict within the weather models about a possible change in the jet that would bring the very western edge of a deep Arctic Front into the area. However, that would bring our temps down into the 30's. Our neighbors to the North and East could see high temps around -20F by the end of next week, so count your blessings! This Arctic air mass is one of the coldest to hit the country in decades, so we will keep an eye on this one. The severe temperature inversions of last week will hopefully give us a break so that a large ridge of high pressure can begin to warm the valleys. The mountains were beautiful last week, but the valley's were socked in with fog for most of the day. We had the weak storm pass through Saturday, that moved out the stagnant valley air and moved in some more cold air. 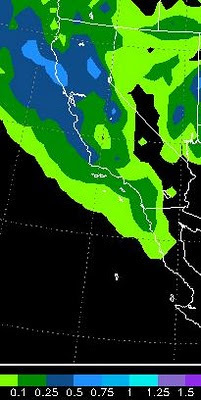 Tomorrow and Wednesday we will have another system just clip us, that should change the valley air again. I do not see any major storms for the area until at least the 23rd of January. We should see highs toward 50 starting by Wednesday and nearing 60 early next week! I just heard a weather forecast on the radio talking about a storm for Tuesday and Wednesday. This system is well to our north and will stay there. This "storm" will produce no mountain or valley precip for the Tahoe area. Not sure what weather models those guys look at sometimes? A ridge of high pressure is dominating our weather leaving little or no chance for valley precipitation for at least a week and probably longer. The trend is to move out of our 45 day stormy pattern and into a much drier, warmer pattern. There will still be small storms to pass through our area and leave snow in the mountains, but now would be a pretty good time to wash the car. A persistent Low Pressure system is moving onshore and poised to dump a reasonable amount of snow in the Sierra, especially the central Sierra around Mammoth. This little low moved down the coast and was originally forecast to have little effect on our weather. However it moved onshore and held together nicely. 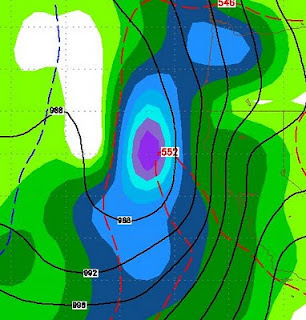 Mammoth could receive up to 3 feet of snow from this system. Tahoe is looking at about half that by Monday morning. Looking ahead, a ridge of high pressure will dominate our weather from Tuesday through Friday. After that another decent system will move into the area for next weekend. I will update this week.